Still this is a lot of code to type, plus the "TAG," parameter every time you use the log command in your code. Well, you probably don't mind extra four characters typed, but if you multiply this by the number of times you scatter this line in your code (which is quite likely a big, big number), it becomes a large chunk of time that can be better spent doing something else, just because the API asks you to provide the value of the parameter that might be obtained for you automatically. What's the catch ? Many of you probably noticed that there is a new object created for every log method call - the new Exception needs to be thrown to get the Stack Trace to analyze. This might be definitely problematic inside the tight loop, but there are ways to deal with this. 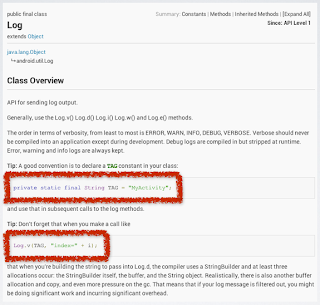 First, you can shortcut the log message origin inspection (for production environment, for example) or use the excessive object allocation (and subsequent garbage collection calls) to your advantage to spot these tight loops with unintended log calls in them (you most likely don't want to have logs in the tight loops anyway). 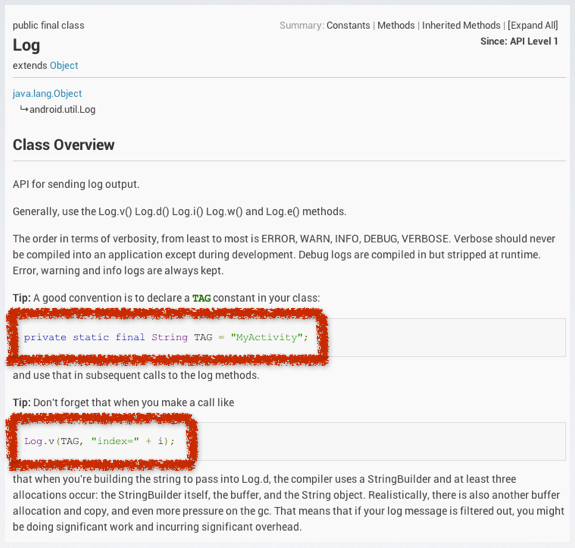 Another alternative is to resort to the original API: it is still there for you to use and there is nothing wrong with it if you know what is the purpose of explicitly provide the log context information. It just feels stupid to me to do so every single time just because the poor designed API asks you to do so. and you are done. If you fail to provide this connection, the logging still works but it would resort to the platform neutral bottom line, System.out.println(); which in turn would omit the TAG information. Hope you find the simplification to the default Android logging system useful and become a happy user of logdroid library. It only saves four key strokes at a time, but in the long run we hope it would be well worth the investment.